I've got a buncha stuff to memorize, and a buncha yogurt in the house. Let's bake! Put on the Edie Sedgwick soundtrack and measured out a lot of sugar. …and lots of peanut butter! Also in there - rolled oats and flour. I didn't use any mix-ins, and I also didn't have the patience to roll the dough into little balls! 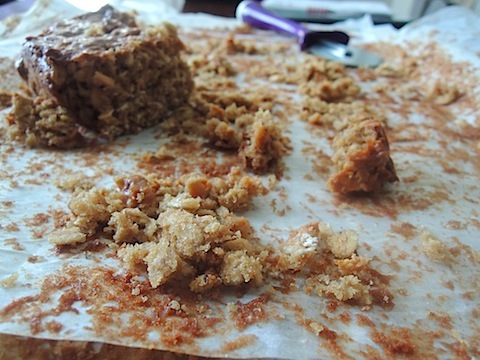 …but instead I kept working, and allowed them to cool for a few hours, so they'd cut nicely into 15 squares. I'm pleased with how they turned out - but don't bite in expecting a chewy gooey blondie, or something packed with Peanut Butter. They're hearty, and very subtle in flavor - perfect for breakfast or a late afternoon snack. Combine the yogurt and sugars, then add vanilla/eggs/banana/peanut butter. Mix the baking soda, oats, and flour. Add to the wet ingredients. 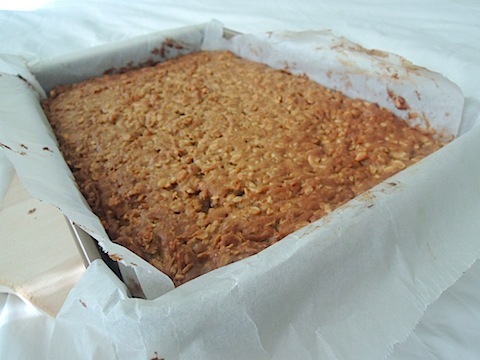 Pour into a 9x13 pan lined with parchment paper. Bake at 325 degrees for 40-45 minutes, until a toothpick comes out clean. Allow to cool before cutting.